Is it a game? Is it an election poll? Is it a marketing app for a movie? All of the above and then some! Confession. We have never made a game on Android before this one. We also had less than one month to conceptualise theÂ game, learn how to make a game on Android and roll it out live. But once we saw the movie Yeh Hai Bakrapur, we knew we wanted to be associated with it and were up to the challenge. Yeh hai Bakrapur (the movie) is a social satire set against the backdrop of rural India. A multi-layered film, it is a hilarious take on the complex belief systems that prevail in Indian society and the conflicts that ensue thereon. 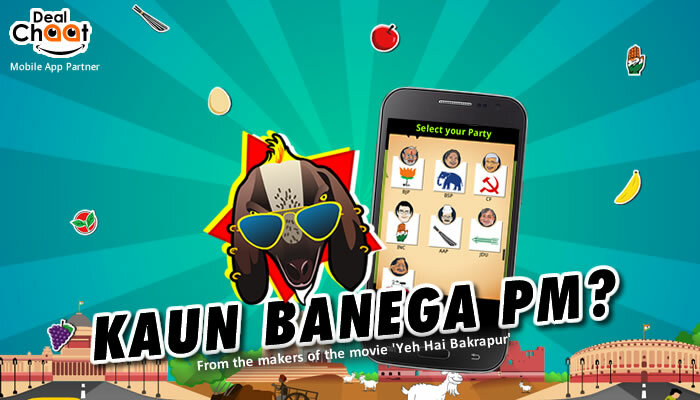 Kaun Banega PM is a fun Android Game built as a part of the digital marketing asset for the movie. The game leverages the topical election furore in India and incorporates the main protagonist of the movie – Shahrukh – a bakra, in a fun way. The player has to select a party (and prime ministerial candidate) of their choice and collect as many votes for them as possible by tapping on the party symbol and PM candidate falling from the top of the screen. Tapping on another party’s symbol/candidate however results in votes for the party whose symbol is tapped/negative scoring. Additional gamifying elements like high-score leaderboard, incentive of increasing game score by tapping on fruits, possibility of negative scoring and also powerups were added for an enhanced experience and improved game design. The main USP of the game differentiating it from other apps on a similar theme on the Google Play Store is the national leaderboard. The votes collected by the player during the game get added to the national leaderboard. Players can see which party is winning the elections at the national level as well as at their state level. The leaderboard also gives other interesting stats like which party got selected how many times, what are that day’s score and what is the average daily vote count. Download the game and take it for a spin!